I love narrative poetry, and this book was no exception. At the height of the Vietnam War, 10 year-old Kim Ha is forced to leave Saigon with her mother and older brothers. Her father has been missing for several years, and the family continually hopes for his return. The decision to leave is heartwrenching, knowing that if they go, there will be no real way for their father to find them again, if indeed, he is still alive. Ha's mother gives her children the option of saving one thing... everything else must be destroyed, so as not to leave any evidence behind for the invading soldiers. Once aboard the ship, the family suffers from extremely close quarters and lack of food. The boat captain's unlucky snap judgement on the best escape route means that their journey is drawn out much longer than they had anticipated, necessitating rationing. People grow ruthless and hoard what little food they have. The ship is rescued by Americans, and the families make their way to the States. Salvation? Hardly. Ha and her family end up in Alabama in the early-70's, with racial tensions at an all time high. After everything she's been through, Ha must endure appallingly racist bullies at school, as well as condescending teachers, who don't understand that just because she hasn't learned English perfectly yet, that doesn't mean that she isn't a bright and extremely observant girl. Ha is desperately homesick and finds heavily-processed American food disgusting compared to the fresh papayas and traditional Vietnamese fare that she is used to. At this point, I really began to wish for some sort of break from the unrelenting sadness of the story - whether by comic relief, or a sympathetic character to lighten the tension. I had hoped that Ha's neighbor, Miss Washington would fill the bill, but even though she's kindly and means well, ultimately she comes across as a dotty old lady who doesn't quite get it. A semi-autobiographical story, this book is simultaneously difficult to read, and very accessible. The four "chapters" it's broken into: Saigon, At Sea, Alabama, and From Now On, neatly break up the action. The emotional turmoil that Ha goes through makes this book quite challenging indeed, but the words flow so smoothly it's hard not to get drawn in to the tale. The writing was wonderfully crafted and made reading about the immigrant experience completely compelling. 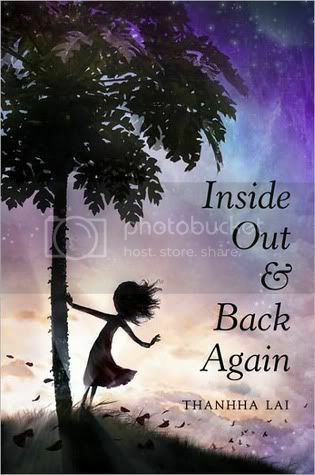 As powerful, arresting and in some ways just as sad as The Bridge to Terabithia, Inside Out and Back Again could definitely be a Newbery contender. It's a good read about one's emotional experiences.